2018 is marking the fortieth anniversary of the great wave of UFO sightings over Italy in 1978, the year with the greatest numer of reports and case histories collected throughout the twentieth century. Twenty years ago, the Italian Center for UFO Studies (Centro Italiano Studi Ufologici, CISU) already devoted its 13th national congress to re-examining that extraordinary year, with analysis and comparison of the international scene. A few months ago, 40 years after the events, the CISU launched a new “Project ’78” based on the center impressive archives, a project with two different sections, whose first results are coming in these days. A first part of the project consisted in the digitalization and full indexing of all press sources of that year. The Italian UFO wave of 1978 was in fact mostly a media wave, overwhelming newspapers and other mass media all around the nation, in a very pervasive way, unprecedented in the past (and in the future as well), as it is also apparent from the annual totals of newsclipping in CISU Press Archive: never before that time (*) more than two thousand press cuttings had been collected in just one year, as in 1978, and never that happened again in the following years. The ufomania in Italian newspapers was already remarked at the time, sort of a “UFO psychosis”. 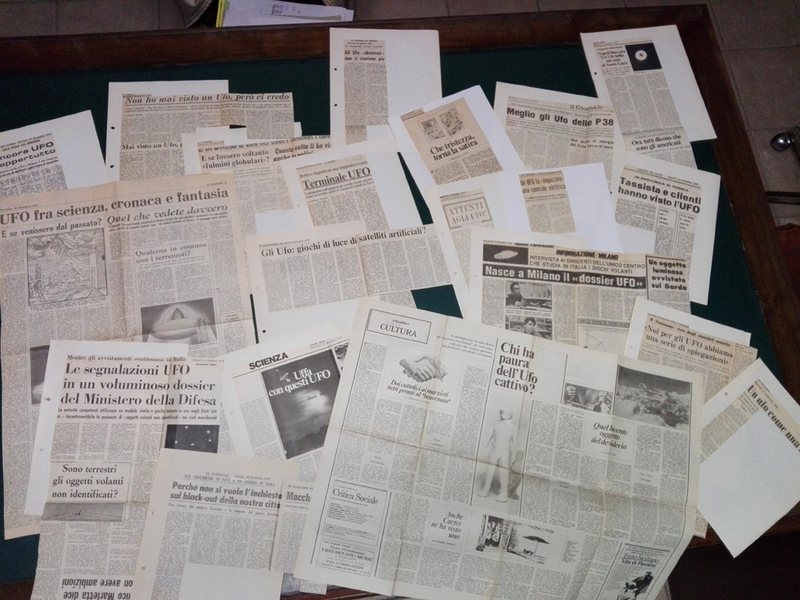 All collected newscuttings had long been ordered and set up on A4 paper sheets at CISU headquarters, where the 1978 section occupies seven archive boxes of (mostly original) clippings taken from dailies and local information newspapers, plus an eighth folder containing extracts from the illustrated magazines (which published extensive services on the UFO topic, in that year). In the last few weeks, some CISU volunteers have worked on the full scanning of this collection, which was completed in early May, 2018: 2,400 articles from newspapers, which will soon be joined by those from illustrated magazines. 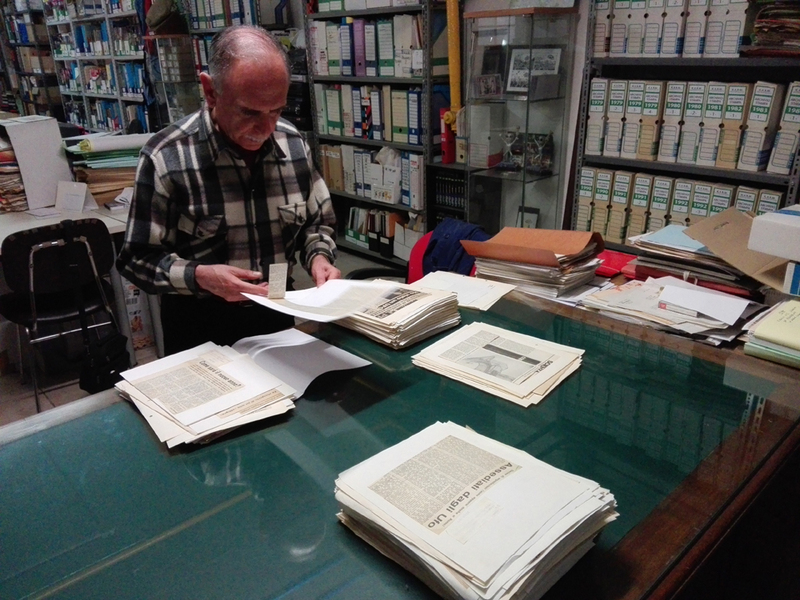 Upon this work, other volunteers are currently “renaming” the individual files so that they directly indicate the newspaper and the date of publication, to allow an automatic indexing and an easier recovery. 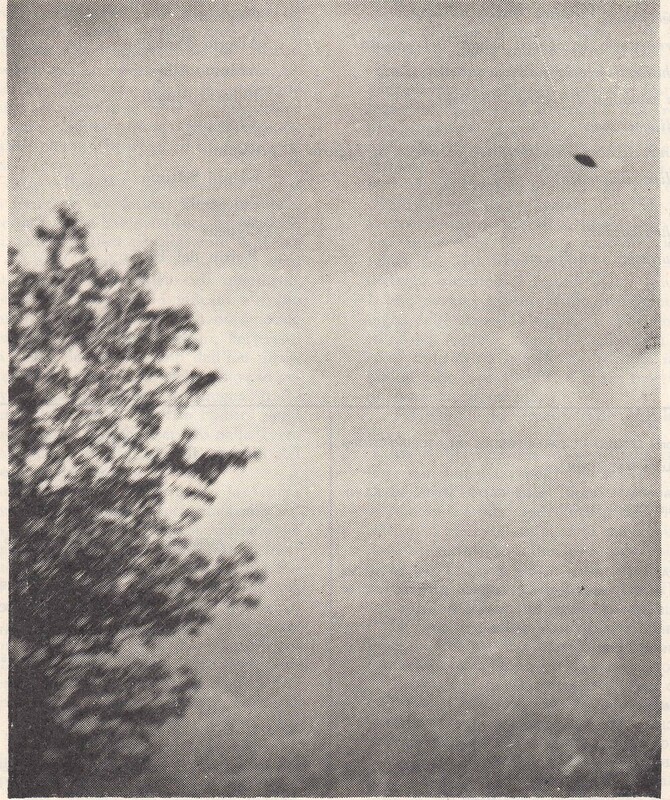 By the end of May a second part of the project will start, concerning UFO sighting case histories. The national catalog of Italian UFO sightings currently includes 1,800 reports for 1978, each one corresponding to an archive folder containing all sources relating to it. In recent years a meticulous work of cross-checking has been done between the already existing files and the sources subsequently collected or not recorded at that time, with the following reproduction and filing of several hundred “new” cases. At the end of this work we will now move to the indexing of these new cases, entgering coordinates (date, time, location, type) in the general database. This second phase of the project should be completed before the summer. That’s a concrete way of commemorating the 40th anniversary of the greatest UFO wave of all time in our country. (*) with the incredible exception of 1954: more than 4,000 articles, but only recovered in recent years through the systematic and targeted research of the “Operation Origins”. “A Dark Red Sky” (Un cielo rosso scuro) is the literary title of Giuseppe Stilo‘s new book (UPIAR publications, 2017) devoted to the arrival of flying saucers over Italy and the world, in 1947-1949. A thorough and well-documented 414-page volume which, once more, places Stilo in an authoritative position in the study of the UFO phenomenon. This book inquiries into the initial period of the phenomenon, but this requires to be seen in the perspective provided by the author’s entire opus. It all began with “Operazione Origini” (Operation Origins), a CISU project started in 1984 to retrieve press cuttings for the early years (1946-1954) on which he embarked in 1988. He has since continued to produce a history of UFO reports in Italy and in the rest of the world. The encyclopedic erudition of Stilo in ufology has not many parallels. His work documenting what had happened, when and where is overpowering. Reading what is already a veritable library of books by him, might save a newcomer dozens of years’ worth of investigation and documentation. Therefore, I will hardly touch this one volume that, naturally, wanders by the Italian panorama in 1947 and the birth of the flying saucer phenomenon, the 1947-48 wave, the “phantom airplanes” of 1948-49, the growth of the ETH during 1949 and the impact of foreign reports in the Italian media. 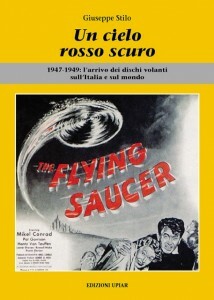 The book makes a quantitative analysis of cases known in the 1947-1949 period in Italy and reviews the international panorama of the flying disk prodigy. “Scrutate I cieli!” (Watch the Skies! ), UPIAR, 2000. 424 pages to document the 1950 wave. “Ultimatum alla Terra” (The Day the Earth Stood Still), UPIAR, 2002. This large volume of 536 pages deals entirely with the 1952 UFO wave. “Il quinto cavaliere dell’Apocalisse – Vol. 1” (The Fifth Horseman of the Apocalypse – Vol. 1), UPIAR, 2006. This first volume, a mammoth tome of 680 sheets, covers the large wave of 1954 from January to October. “Il quinto cavaliere dell’Apocalisse, Vol. 2” UPIAR, 2016. The second tome with 504 pages is devoted to the months of November and December 1954. 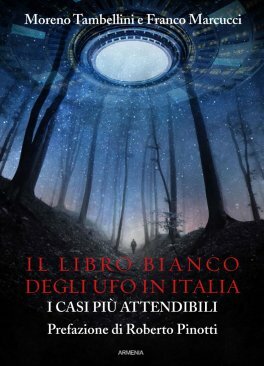 It’s just arrived in Italian bookshops Il libro bianco degli UFO in Italia (The White Paper of UFOs in Italy), by Moreno Tambellini and Franco Marcucci (Armenia publisher, 350 pages). This is not the usual book made of anecdotal sightings patched up from here and there, as is unfortunately the case of too many UFO publications, not only in our country. The volume is instead the result of a project representing the evolution and the deepening of a pioneer collection and cataloguing work started by Sezione Ufologica Fiorentina (Florence UFO Section) and in particular by Solas Boncompagni) in the 1960s. That longtime work led to the publication of six volumes of the “UFOs in Italy” book series (published from 1974 to 2012), covering Italian case histories throughout the twentieth century, but over the years it had gone more and more losing the original intention to provide not only a collection but also a selection and evaluation of each report, on the basis of a proper “veridicity index”. 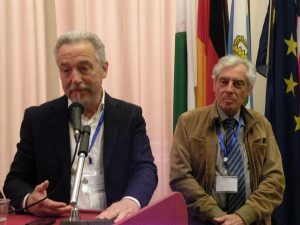 What was meant by Tambellini and Marcucci (both members of SUF third generation) was precisely a return to the origins of that project, by re-elaborating objective criteria to select the 43 best cases (as of reliability of the testimonies) among the approximately 12,000 files registered in the SUF archive (now merged into Centro Ufologico Nazionale’s files). The book presents those best cases in detail, based on the documentation (not always complete, alas) available to the authors. The result notwithstanding, this is a methodology that – unlike almost everything that can be found in bookstores and on newsstands in our country – is starting from case histories and is trying to apply rational, objective and homogeneous criteria to its analysis: an approach that moves along the line that has always characterized our own way at CISU. Since the early hours of today, dozens of reports of a bright object crossing the sky have begun to arrive, from half of Italy (and Southern Europe as well). In our country, the phenomenon has been observed at least from several regions (Liguria, Tuscany, Lazio and Campania), with videos and photographs taken by witnesses still awake shortly after two o’clock in the night between Saturday and Sunday, when watches were supposed to be moved forward one hour. Ufologists will systematically collect reports in the coming days, but the first reports available on the net and accompanied by photos and videos were those from Anzio (RM), Nettuno (RM), Fondi (LT), Pozzuoli (NA), Benevento (BN), between Salerno and Maiori (SA), in Vallo di Diano (SA) and Padula, a Battipaglia (SA) and other locations in Campania. Mass observations of luminous aerial phenomena of this type are a recurring phenomenon, well known to ufologists since the early ’50s, and were baptized “flaps”: unlike typical UFO sightings (expecially high degree strangeness reports) that involve few people in a single location, in the flaps there are tens or hundreds of contemporary testimonies from different localities, which describe the same phenomenon. Flaps reporting the quick passage of one or more luminous objects, with or without a trail, following a generally straight path, are mostly due to two types of causes (which have very similar phenomenic features): bolides and atmospheric reentries of artificial satellites (or rocket parts that put them in orbit). 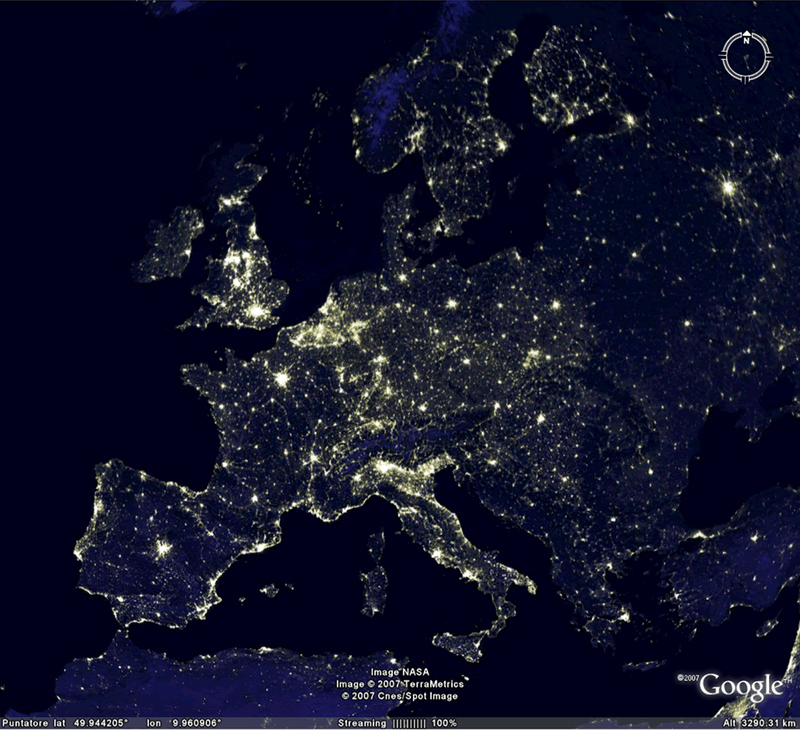 One of the most sensational and better studied took place on the night of June 6, 1983, but this type of events occur on Italy every two to three years on average. Last night phenomena were in fact caused by the return to the atmosphere of the third stage (2018-026B) of the Soyuz MS-08, which was launched last March 21 from the Baikonour (Kazakhstan) cosmodrome to bring International Space Station two US astronauts and a Russian cosmonaut. According to US infrared satellites, as reported by amateur astronomeur Marco Langbroek, the reentry took place at 03:25 (summer time) around the coordinates 41.9°N, 8.1°E, above the sea off Ajaccio, Corsica, along a path that would otherwise have continued parallel to the Italian coast. Fewer UFOs in the Sky, More News in the Media? While UFO sighting reports by eyewitnesses are diminishing, the number of articles and items about UFOs in Italian media are strongly increasing. The comparison is even more surprising if we consider that the CISU has not renewed its 26-years long subscription to L’Eco della Stampa (Echo from the Press) newsclipping agency, expired in July 2017 and started in October 1990 (over 22,000 articles received). From that moment, the monitoring of Italian mass media is entirely based on the voluntary service of our members, which have already shown an even higher efficiency than the paid service, in the last few years. 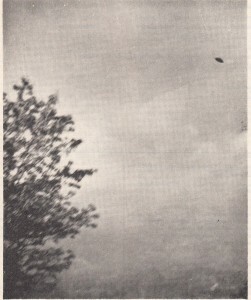 It’s often been claimed that the number of UFO sightings is related to how much (and when) newspapers talk about it. The contrary has been true in Italy: the number of press reports on UFOs has been steadily increasing in the last five years, while the number of UFO reports has always been decreasing. That fact drastically denies any correlation between those two variables, in spite of any superficial and unjustified sociologisms. 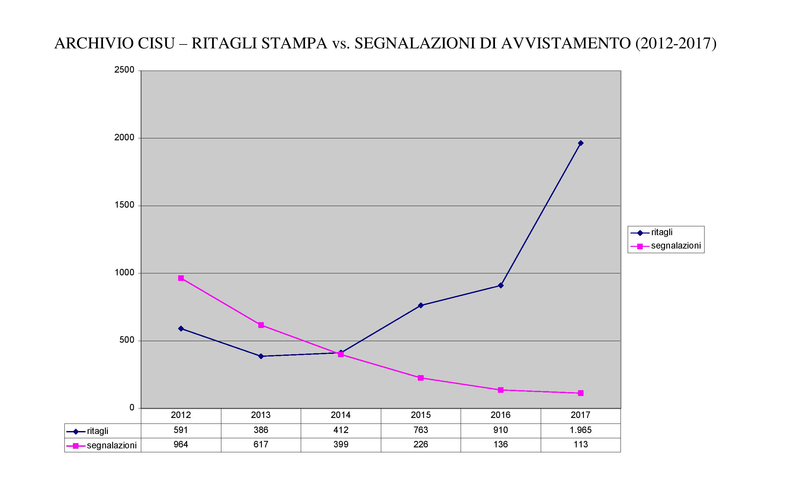 After the publication of CISU data about UFO reports collected in 2017, also the CUN (National UFO Center) published its data about UFO sighting report received last year (110 in all), confirming the downward trend not only compared to 2016 but also within the whole decade, unlike some sensationalist claims by some Italian media in early January. 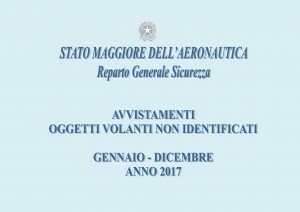 Although less significant, the number of reports coming from Italy to the Mutual UFO Network (MUFON) Case Management System, which offers the best known online direct collection system in the world (7,686 sightings worldwide last year), remained unchanged (22 in 2016, 22 in 2017) but the language barrier makes it a very partial indicator for non-English-speaking countries. 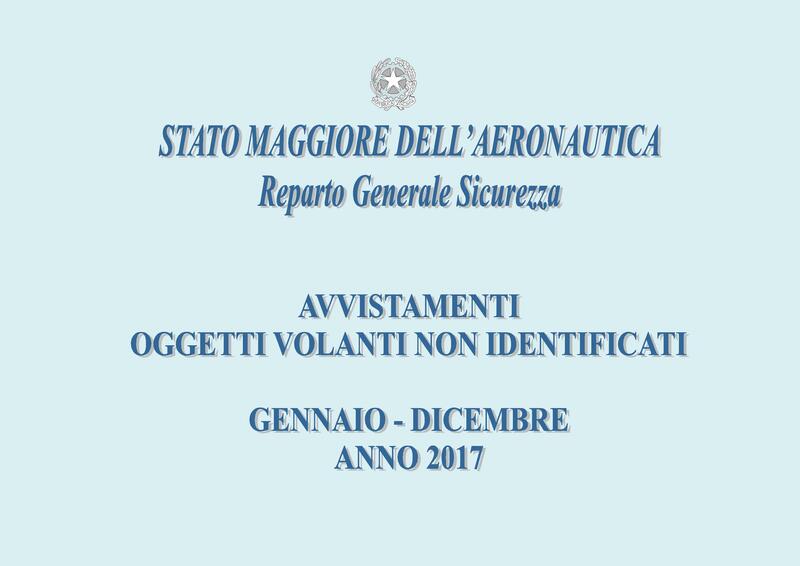 Also the General Security Department of the Italian Air Force has now released the usual annual summary of reports of unidentified flying objects (UFOs) received in 2017 and for the first time since 1979 (when this service was started) no UFO sighting report has arrived to the Italian military for the whole year. As already noted in the past, in Italy – unlike other countries – the annual totals of UFO cases received by the government have always been much lower than those collected by private UFO associations, but a total of zero is remarkable anyway. 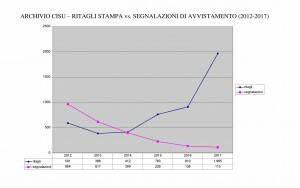 In line with the trend of the last few years, the number of UFO reports in Italy seems to fall further down, based on a first analysis of data collected for the year 2017 from the CISU (Italian Center for UFO Studies), which has been monitoring UFO sightings in Italy since 1985 (over 25,000 reports since 1945). If it’s true that the 113 sighting questionnaire forms received directly from witnesses through CISU website in 2017 are slightly more numerous than the previous year, if considering also the third-party sources (websites, newspapers, other UFO organizations) it seems probable that the final result will be a further, marked decline in sightings, confirming the same trend already seen in previous years. One year ago, in the early days of 2017, you could already count around 500 sightings for 2016, later increased up to the total of about 600 reports known as of today. According to the real-time catalog CisuCat coordinated by Pasquale Russo on the website UfoWeb, we can now count as little as 250 for 2017. Of course this total is destined to rise as 2017 sightings continue to emerge during the current year. However, based on the data available so far it is possible to estimate a total not exceeding 450-500 sightings, i.e. a significant drop compared to the 600 reports known today for 2016.